September 11th used to be a day I looked forward to because of my years of working in emergency communications. Since the national emergency number is in fact 9-1-1, the United States government set aside the eleventh day of September as a day to honor telecommunications officers working in public safety, many thousands of dedicated men and women without whom, our emergency forces would be in disarray. For years, we celebrated them all but the meaning of that day changed in 2001with the attacks on the World Trade Center, the Pentagon and the crash in Pennsylvania. They say you never forget where you were or what you were doing when something particularly tragic happens. My grandmother remembered exactly what she was doing the day that Pearl Harbor was bombed and my mother can remember where she was and what she was doing when she learned of the death of both John F. Kennedy and Martin Luther King. I can remember with great detail the day that the space shuttle Challenger exploded shortly after takeoff and like most Americans born before 1995, I can remember the details of the 9/11 tragedy in New York initially and what followed in Washington and Pennsylvania as the events unfolded. Being in the Eastern time zone put me in the same “moment” as the events when they took place and I realized as I watched them unfold before my eyes that life had changed. At first, I innocently assumed that this fire would be put out, the building safely evacuated and the loss of life would be minimal. I innocently assumed that the damage would be repaired and life would go on for everyone else. Unfortunately the age of innocence died a few moments later when the second plane hit the other tower. That was the pivotal moment for me…and for many Americans because we knew…beyond a doubt…that this was not an accident anymore. One plane could certainly be an accident but two was coordination and that changed the whole meaning of what we were seeing. As those towers collapsed, both of them symbols of our financial power and strength, now in ruins and covering the remains of thousands of people, we too found ourselves covered by a cloud of darkness. Our arrogant presumption of invulnerability against the assaults of others lay smoldering in the ruins of the World Trade Center. Transition from the old world of thought into the current day of concern happened as countless Americans remained glued to the television for many days to come. We watched televisions at the office, we watched them at home and we listened to the news in our cars between the two. We watched our President and Congress come together and we heard words of hope from Billy Graham. We needed heroes and we found them in the men and women who poured in to rescue survivors and bring home the bodies of those who didn’t. We learned of the valiant efforts of the passengers of the one flight that didn’t find its target, brought down by people knowing they would die saving the lives of others. We slowly got past the shock but most of us will never get past the pain of what happened that day. The events of September 11, 2001 began and ended on the same day but the repercussions of that day have echoed forward in time to the present in ways both known and unknown. A complete generation of children has been born since that event to a world in conflict and a country that has been shaken by war, economic collapse in many sectors and uncertainty. As parents, we try to protect them as best we can while worrying that someday they may put on the uniform and place themselves in harm’s way to protect us. Generations of parents have gone through this same ordeal and I don’t see that stopping anytime in the foreseeable future. This week I watched as the body of a young serviceman was brought home to the town adjacent to our own, a young man killed in Afghanistan while doing his duty as a Marine and I think of his parents and I think of my own son, still young and whole and unharmed and I worry about him. Several of my friends who had children way before I did have already had to watch their child, grown in the eyes of the law but still a child to them, go off to fight against a terrible enemy and I feel for them knowing I may stand in their shoes someday. They worry about them but yet, their pride shows in the words they speak of them and rightly so. I believe there is still hope and that we can find it, hope for a better future and for a safer one for our children and their children. The best hope we have right now is not the President and it’s certainly not the Congress….it’s those young men and women who fight to protect us from those people who would want us dead…and it’s also the men and women who wear a different uniform, patrolling our streets, protecting our homes and saving our lives. The first casualties of 9/11 were civilians but the second ones were firefighters, police officers and medics, all of whom gave their lives to protect and serve. 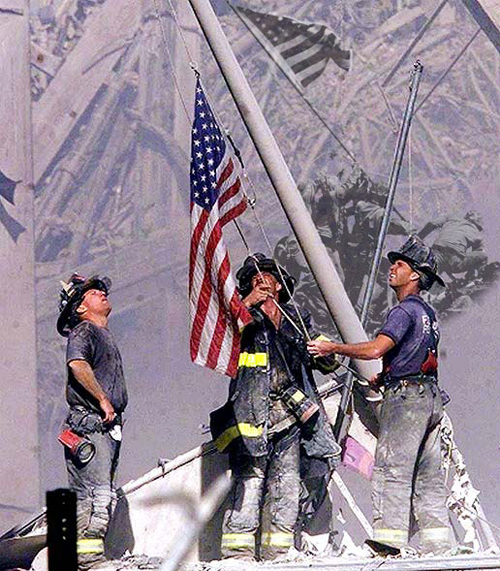 For 9/11 day, let us remember ALL of them….citizen heroes, servants of the public and soldiers….and resolve that their lives were not given in vain….and then let us honor those serving today and who work hard to make sure that we never have to face that again.